(Leah Hogsten | The Salt Lake Tribune) Gonzaga Bulldogs guard Josh Perkins (13) is fouled by Baylor Bears guard Jared Butler (12) as Baylor faces Gonzaga in the second round of the NCAA tournament in Salt Lake City on Saturday, March 23, 2019. 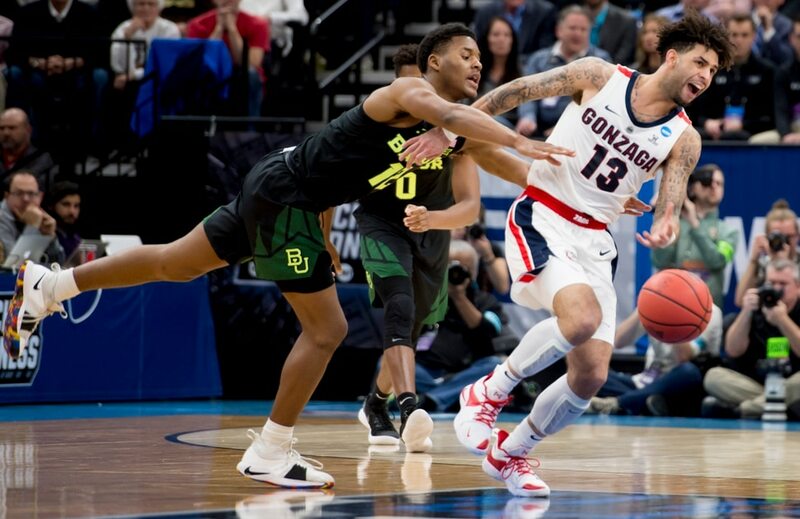 (Leah Hogsten | The Salt Lake Tribune) Gonzaga Bulldogs guard Josh Perkins (13) scores as Baylor faces Gonzaga in the second round of the NCAA tournament in Salt Lake City on Saturday, March 23, 2019. 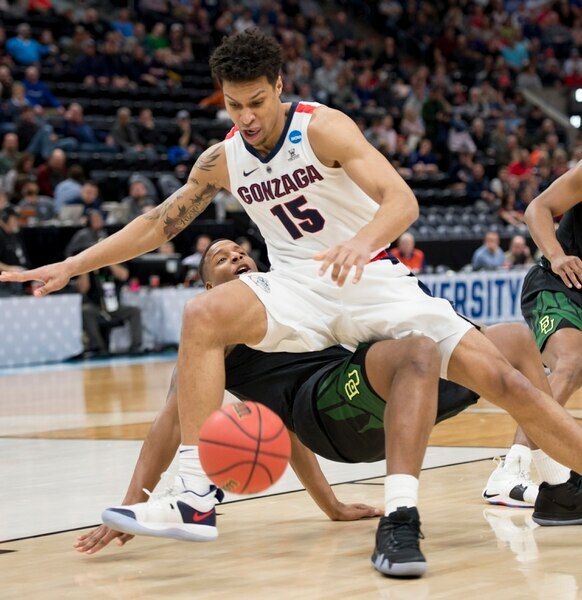 (Leah Hogsten | The Salt Lake Tribune) Gonzaga Bulldogs forward Brandon Clarke (15) collides with Baylor Bears guard Mark Vital (11) as Baylor faces Gonzaga in the second round of the NCAA tournament in Salt Lake City on Saturday, March 23, 2019. (Leah Hogsten | The Salt Lake Tribune) Gonzaga Bulldogs guard Josh Perkins (13) is defended by Baylor Bears guard Jared Butler (12) as Baylor faces Gonzaga in the second round of the NCAA tournament in Salt Lake City on Saturday, March 23, 2019. (Leah Hogsten | The Salt Lake Tribune) Baylor Bears guard Jared Butler (12) goes for the ball under pressure from Gonzaga Bulldogs guard Zach Norvell Jr. (23) as Baylor faces Gonzaga in the second round of the NCAA tournament in Salt Lake City on Saturday, March 23, 2019. (Leah Hogsten | The Salt Lake Tribune) Baylor Bears guard Mario Kegler (4) shoots over Gonzaga Bulldogs forward Brandon Clarke (15) as Baylor faces Gonzaga in the second round of the NCAA tournament in Salt Lake City on Saturday, March 23, 2019. (Leah Hogsten | The Salt Lake Tribune) Gonzaga Bulldogs guard Josh Perkins (13) cheers as his team dominates Baylor in the first half of their game in the NCAA tournament in Salt Lake City on Saturday, March 23, 2019. (Leah Hogsten | The Salt Lake Tribune) Gonzaga Bulldogs forward Brandon Clarke (15) blocks a shot by Baylor Bears guard King McClure (3) as Baylor faces Gonzaga in the second round of the NCAA tournament in Salt Lake City on Saturday, March 23, 2019. (Leah Hogsten | The Salt Lake Tribune) Gonzaga Bulldogs forward Brandon Clarke (15) reacts to a call against him as Baylor faces Gonzaga in the second round of the NCAA tournament in Salt Lake City on Saturday, March 23, 2019. (Leah Hogsten | The Salt Lake Tribune) Baylor Bears guard Jared Butler (12) shoots over Gonzaga Bulldogs forward Brandon Clarke (15) as Baylor faces Gonzaga in the second round of the NCAA tournament in Salt Lake City on Saturday, March 23, 2019. (Leah Hogsten | The Salt Lake Tribune) Baylor Bears head coach Scott Drew talks to Baylor Bears guard Devonte Bandoo (2) as Baylor faces Gonzaga in the second round of the NCAA tournament in Salt Lake City on Saturday, March 23, 2019. (Leah Hogsten | The Salt Lake Tribune) Gonzaga Bulldogs guard Zach Norvell Jr. (23) takes a shot as Baylor Bears guard Makai Mason (10) belatedly reacts to getting hit in the face as Baylor faces Gonzaga in the second round of the NCAA tournament in Salt Lake City on Saturday, March 23, 2019. (Leah Hogsten | The Salt Lake Tribune) Baylor Bears head coach Scott Drew reacts as Baylor faces Gonzaga in the second round of the NCAA tournament in Salt Lake City on Saturday, March 23, 2019. (Leah Hogsten | The Salt Lake Tribune) Gonzaga Bulldogs guard Zach Norvell Jr. (23) catches Baylor Bears guard Makai Mason (10) in the face as Baylor faces Gonzaga in the second round of the NCAA tournament in Salt Lake City on Saturday, March 23, 2019. (Leah Hogsten | The Salt Lake Tribune) Gonzaga Bulldogs guard Josh Perkins (13) high fives Gonzaga Bulldogs forward Brandon Clarke (15) as Baylor faces Gonzaga in the second round of the NCAA tournament in Salt Lake City on Saturday, March 23, 2019. (Leah Hogsten | The Salt Lake Tribune) Baylor cheerleaders work the crowd before their team takes on Gonzaga in the second round f the NCAA tournament in Salt Lake City on Saturday, March 23, 2019. (Leah Hogsten | The Salt Lake Tribune) Baylor Bears guard King McClure (3) fouls Gonzaga Bulldogs guard Zach Norvell Jr. (23) as Baylor faces Gonzaga in the second round of the NCAA tournament in Salt Lake City on Saturday, March 23, 2019. (Leah Hogsten | The Salt Lake Tribune) Baylor Bears guard Mark Vital (11) celebrates a basket as Baylor faces Gonzaga in the second round of the NCAA tournament in Salt Lake City on Saturday, March 23, 2019. (Leah Hogsten | The Salt Lake Tribune) Gonzaga Bulldogs forward Killian Tillie (33) and Baylor Bears guard Mark Vital (11) tangle up as they fight for the ball as Baylor faces Gonzaga in the second round of the NCAA tournament in Salt Lake City on Saturday, March 23, 2019. (Leah Hogsten | The Salt Lake Tribune) Gonzaga Bulldogs forward Killian Tillie (33) is defended by Baylor Bears forward Freddie Gillespie (33) as Baylor faces Gonzaga in the second round of the NCAA tournament in Salt Lake City on Saturday, March 23, 2019. (Leah Hogsten | The Salt Lake Tribune) Baylor Bears forward Freddie Gillespie (33) tries to get the ball away from Gonzaga Bulldogs forward Brandon Clarke (15) as Baylor faces Gonzaga in the second round of the NCAA tournament in Salt Lake City on Saturday, March 23, 2019. (Leah Hogsten | The Salt Lake Tribune) Baylor Bears guard King McClure (3) gets a dunk as Baylor faces Gonzaga in the second round of the NCAA tournament in Salt Lake City on Saturday, March 23, 2019. (Leah Hogsten | The Salt Lake Tribune) Gonzaga players celebrate after beating in the second round of the NCAA tournament in Salt Lake City on Saturday, March 23, 2019. (Leah Hogsten | The Salt Lake Tribune) Gonzaga Bulldogs head coach Mark Few reacts as Baylor faces Gonzaga in the second round of the NCAA tournament in Salt Lake City on Saturday, March 23, 2019. (Leah Hogsten | The Salt Lake Tribune) Gonzaga Bulldogs forward Corey Kispert (24) fights to keep the ball away from Baylor Bears guard Mario Kegler (4) as Baylor faces Gonzaga in the second round of the NCAA tournament in Salt Lake City on Saturday, March 23, 2019. (Leah Hogsten | The Salt Lake Tribune) Gonzaga players celebrate after beating Baylor in the second round of the NCAA tournament in Salt Lake City on Saturday, March 23, 2019. (Leah Hogsten | The Salt Lake Tribune) Baylor Bears guard King McClure (3) tries for a basket under Gonzaga Bulldogs forward Brandon Clarke (15) as Baylor faces Gonzaga in the second round of the NCAA tournament in Salt Lake City on Saturday, March 23, 2019. Gonzaga forward Brandon Clarke rolled toward the basket, anticipating a lob pass from guard Geno Crandall. The play developed perfectly, except for this unscripted outcome: The ball went into the basket. Ultimately, Crandall's accidental shot in the first half Saturday night may have cost a Clarke a career scoring high, as he matched his best-ever total with 36 points in the Bulldogs' 83-71 victory over Baylor in the second round of the NCAA Tournament at Vivint Smart Home Arena. That's OK, because the Bulldogs got three points out of Crandall's pass, rather than two for the planned dunk by Clarke. That's how the first half went for Gonzaga. The Bulldogs unintentionally made a 3-pointer and Baylor, the team that thrives by making 3s, went 1 of 10. Crandall was kidding, but this part is true: The Bulldogs know exactly where they're headed. No. 1-seeded Gonzaga (32-3) will play No. 4 Florida State on Thursday in West Region semifinals at Anaheim, Calif., appearing in a fifth straight Sweet 16. 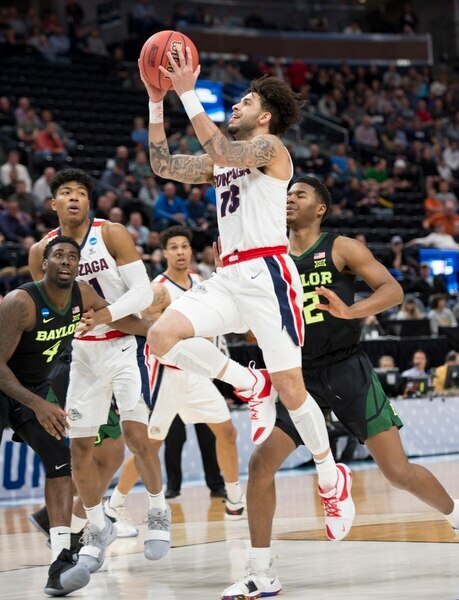 • Gonzaga holds Baylor to 1-of-10 shooting from 3-point range in the first half of an 83-71 victory in the second round of the NCAA Tournament. • For the second time in three seasons, Gonzaga advances from Vivint Smart Home Arena to the Sweet 16. • Former Utah assistant coach Donny Daniels makes the Sweet 16 for a 12th time – including five years in a row with Gonzaga, after four trips with Utah and three with UCLA. Not even Baylor's scoring the first 10 points of the second half could deter the Bulldogs. Baylor quickly got within five points, but Gonzaga responded. Clark scored six straight points via a jump shot, a dunk and two free throws and the Bulldogs never were seriously threatened again. Tristan Clark's foul trouble hurt Baylor, as Drew tried to play a smaller lineup. In addition to his 36 points on 15-of-18 shooting, Clarke posted eight rebounds, five blocked shots and two steals. That sounds like good strategy in a Sweet 16 rematch with Florida State, after the Seminoles upset Gonzaga last March in Los Angeles. On the other end, Gonzaga took away Baylor’s biggest weapon. The Bears had made 16 3-pointers in a first-round win over Syracuse, including six shots prior to the first media timeout. Saturday was another story. Baylor finished 4 of 21 from 3-point range, even while hitting two in a row to begin the second half.